Minimally invasive surgery (MIS) allows physicians to operate with less patient trauma and pain, minimal scarring, faster recovery and shorter hospital stays. Surgeries are performed through small incisions, rather than large incisions used in conventional open surgeries. The use of robotics advances MIS techniques into a new era, further minimizing the impact of surgery on patients. Robotic technology introduces precise, versatile instrument movement combined with three-dimensional visualization of the operative site. Dr. Ceana Nezhat is one of the foremost authorities in minimally invasive techniques, with a specialized focus on endometriosis and the utilization of robotic-assisted laparoscopy. The evolution of his techniques continues to improve patient options and overall outcomes by modifying traditional surgical procedures through the advancement of smaller incisions in MIS. The daVinci® Si-HD with 3D High Definition (HD) surgical robotic system is used when needed by Dr. Nezhat. It is the most advanced platform for robotic-assisted laparoscopy available today. 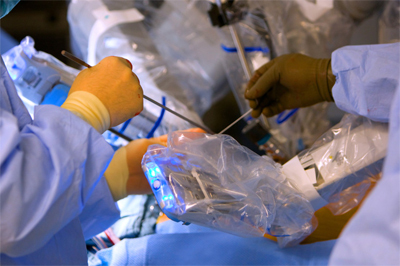 By integrating computer-enhanced technology with surgical skill, this advanced robotic system enables well trained physicians 21st century technology to patients in the operating room. This system 3D HD vision coupled with Dr. Nezhat’s surgical skill affords patients suffering from rare and complex diseases minimally invasive options for complex surgical procedures. Robotic surgery offers benefits to both the physician and patient. For many women, a hysterectomy is often associated with feelings of loss and emotional distress. In addition to the benefits above, robotic surgery translates into faster physical healing, so patients can focus on their emotional healing as well. At Nezhat Medical Center, we are sensitive to these needs, and strive to make every aspect of treatment as positive and successful as possible.